One of our favourite days in the Cape involves a golf/lunch combo. And top choice is golf at De Zalze followed by lunch at one of my favourite restaurants, Terroir – it’s set on the same estate overlooking the course. 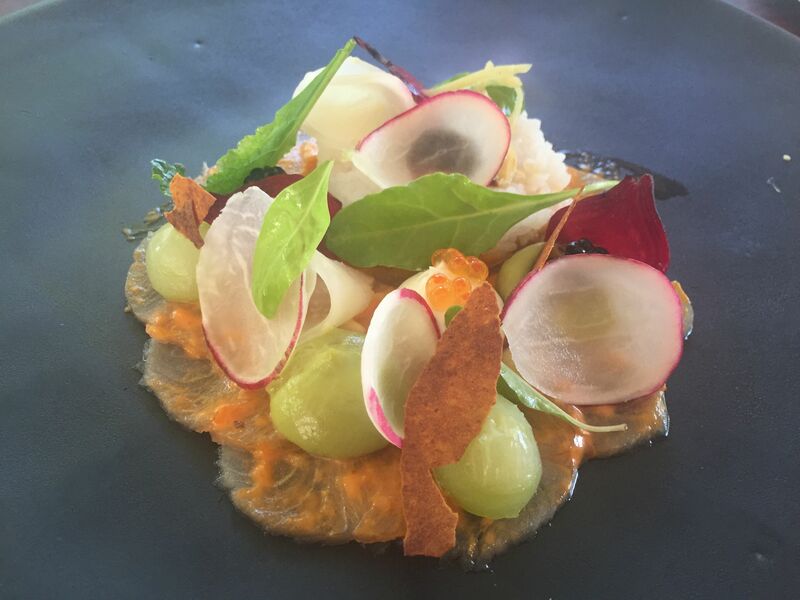 Terroir has been around since October 2004 and has been consistently rated in the top-10 restaurants in South Africa. That’s no mean achievement – the quality of restaurants in SA is extremely high and keeping up standards to make those critics happy must be a constant challenge. One that chef Michael Broughton has conquered. I try to visit Terroir a few times every year during my Cape Town sojourn and have never been disappointed. I don’t know how he does it, beautiful plates of food with attention to detail that amazes me and flavours that combine to produce dishes to dream of. There are so many tiny details on each plate – you should see the kitchen which is buzzing with activity as everyone prepares each delicate element. 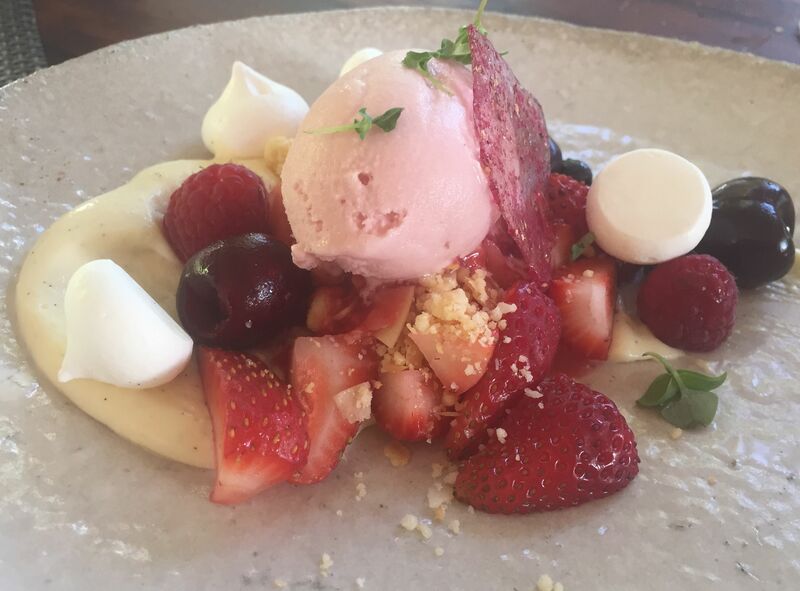 Broughton uses seasonal ingredients to create a menu which is chalked on the blackboard and changes regularly. Today I was excited to see there was a yellowtail ceviche. Yellowtail seems to be jumping out of the Cape seas at the moment, so it’s guaranteed to be very fresh and I love a good ceviche. This one was in a league of its own – as our waiter explained, it’s like deconstructed sushi. The thinly sliced fish was topped with a creamy avocado puree and a spicy dressing with a tasty mound of sushi rice and a sweet soya dressing, fish roe and paper-thin radishes. Different flavours, colours and textures create a dish to savour, one that’s a work of art, too. While the menu changes regularly, as I said, there’s one dish that’s always there and can be ordered as a starter or main. I’m sure they wouldn’t dare remove it from the menu as there’d be a customer revolution! 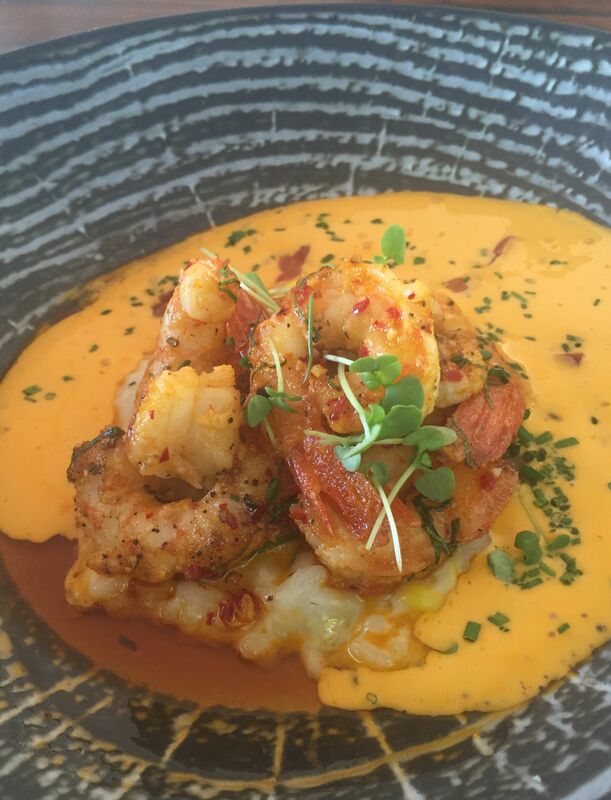 It’s a beautiful prawn risotto served with a sauce Americaine – creamy and luscious – topped with the juiciest of prawns. I’m loving my two-starter strategy these days, it seems the way to go with so many amazing restaurants to visit. I’m convincing myself it’s a healthier option! Today’s second starter – as a main course – was this duck salad. 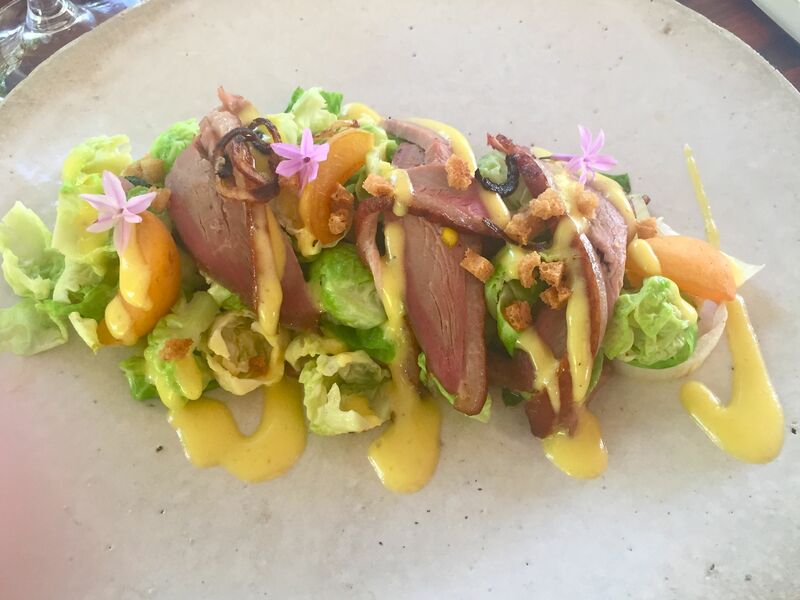 Rare, tender smoked duck served on a salad of separated brussel sprout leaves (how’s that for a different idea) with fresh peach slices and a zesty dressing. A really unusual combination of fresh summer flavours. 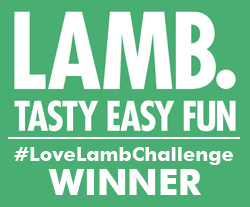 For mains, the beautifully tender lamb dish came with fresh asparagus, intensely flavoured cherry tomatoes and a succulent sauce. 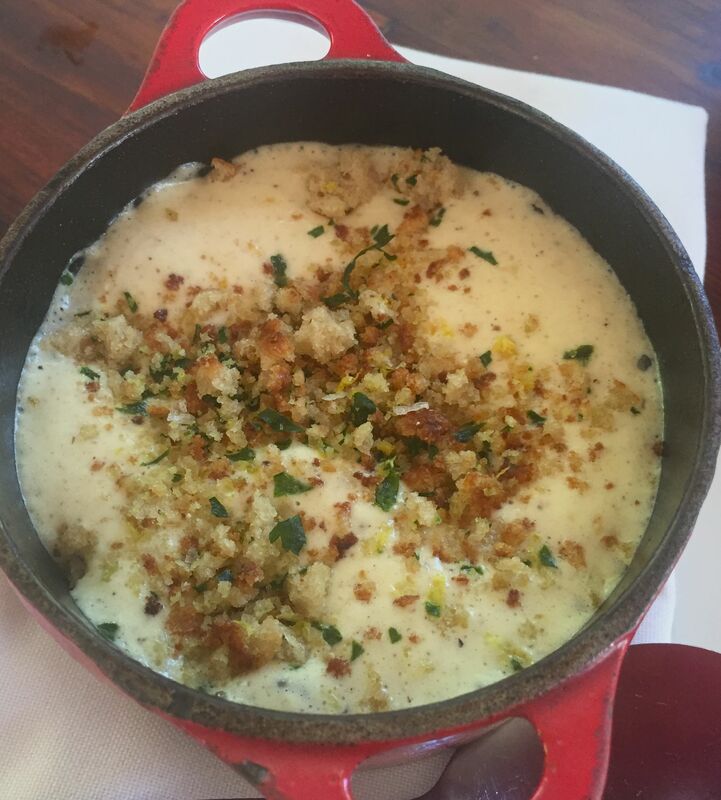 The lamb was served with this tasty bowl of potato and onion with a cauliflower foam. I could eat a large portion of this by itself. Yummy! 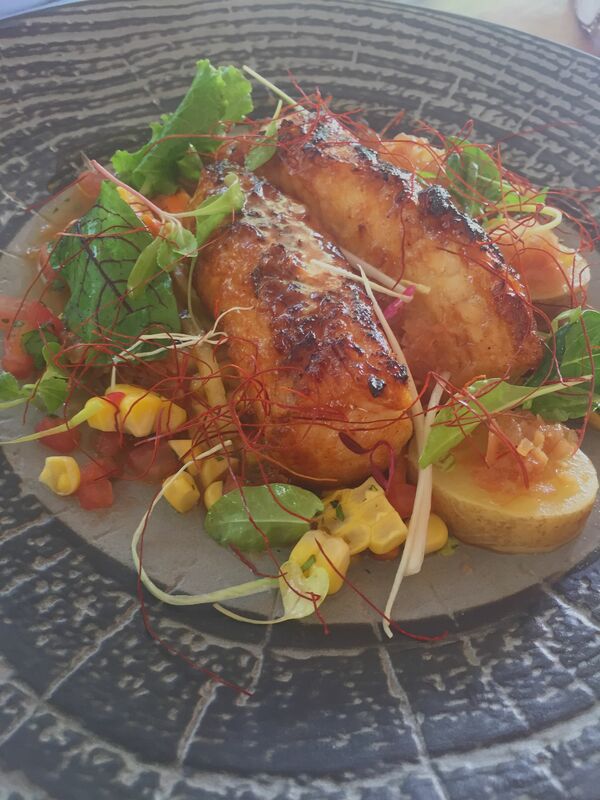 Today’s fish option was monkfish, an unusual feature on a South African menu. It was done barbecued with a Japanese-style dressing/sauce, and delicate greens and other veg. The sweet chunky flesh was perfect with the spiciness of the dressing. Of course we were now all full, but I had to insist that dessert simply cannot be skipped at Terroir. To make us feel less indulgent (greedy?) we ordered three for the table to share and it was totally the right decision. The deconstructed berry crumble came with a velvety vanilla cream, perfectly crunchy mini meringues and plenty of fresh berries. 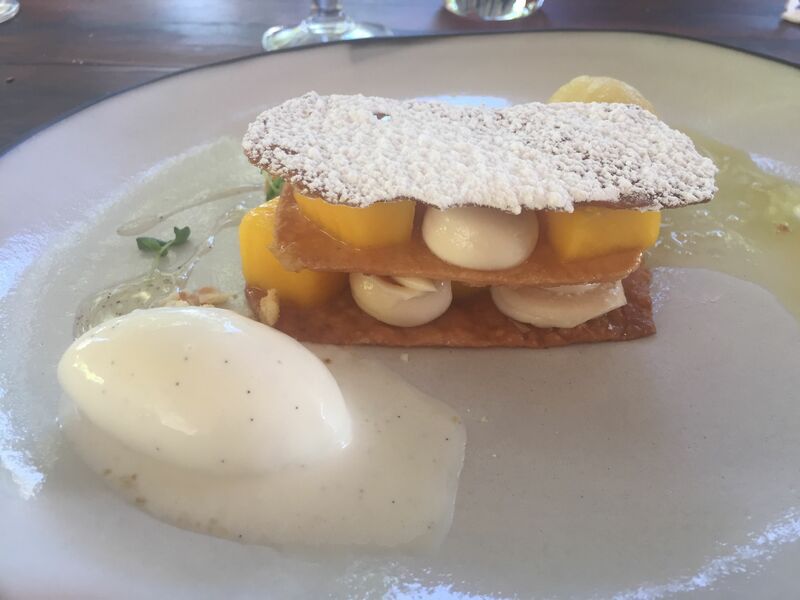 The mango mille feuille looked stylish and tasted light and mango-y with delicious sorbets on the side. 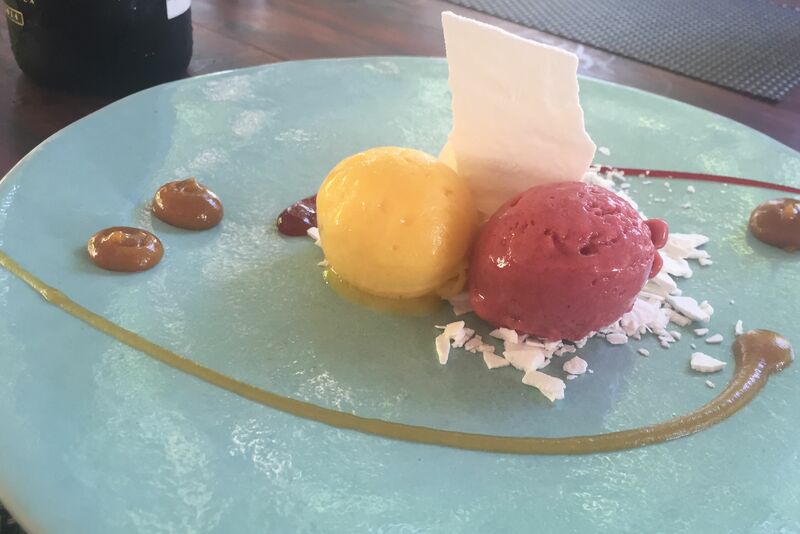 And finally a trio of sorbets – raspberry, mango and lychee. The king of sorbets, I loved the intensity of the flavours, especially the lychee. 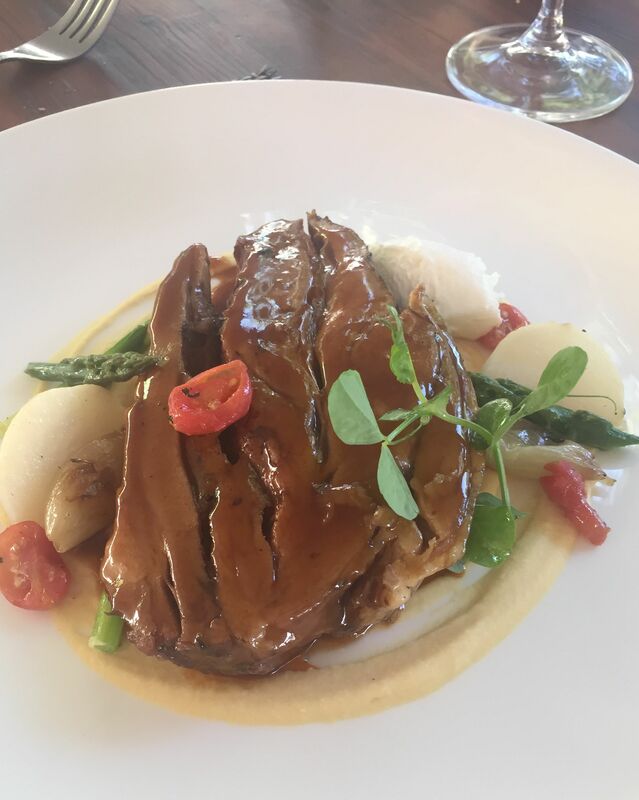 On a sweltering hot summers day in the Cape Winelands we sat under the majestic oak trees at Terroir and demolished a wonderful range of beautiful summer dishes. Lunchtime joy yet again! Top-10 in the country, indeed. I’m sure these beautiful pictures have got your mouths watering. Terror is on the Kleine Zalze wine estate just off the R44 near Stellenbosch.